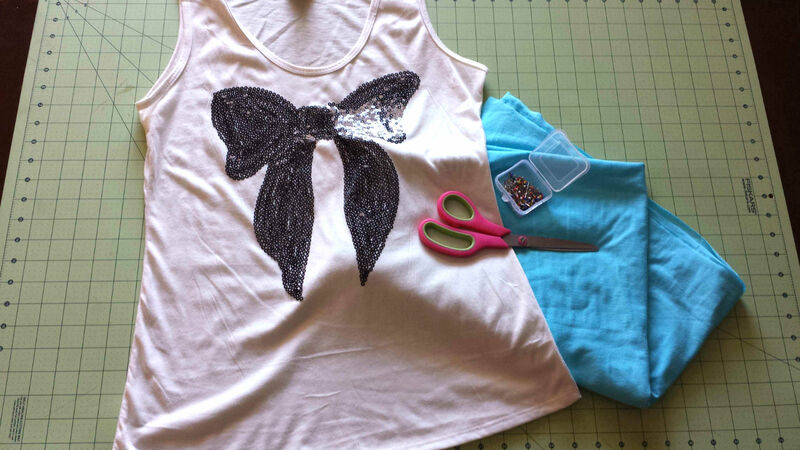 I’ll show you how I made this strap embellishment for a tank top behind the cut! I only needed one yard of knit fabric for this whole project. You may need more or less depending on the shirt you use and its size. Once you find a shirt that has a fit you like and stretches similarly to the fabric you bought (most knits you come across won’t pose a problem, but better to be safe than sorry), lay the fabric down right sides together and place the shirt on top. 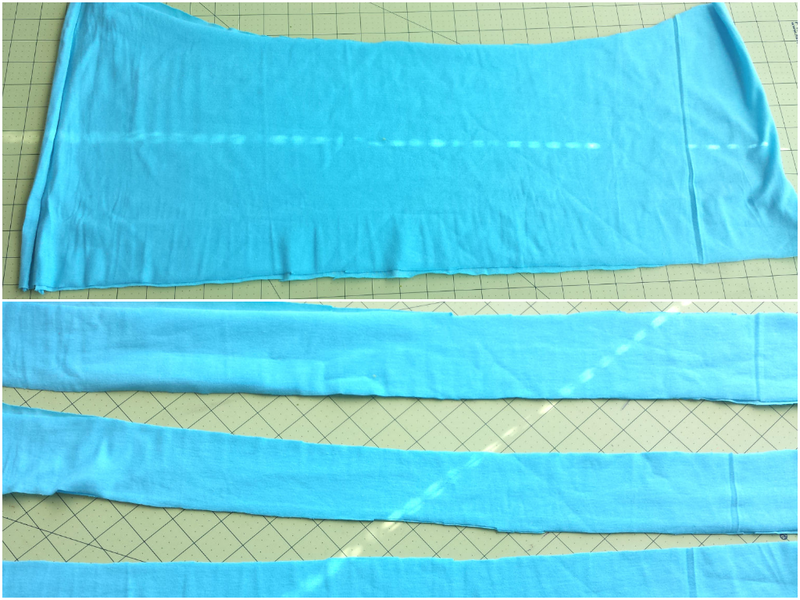 I laid my fabric with the selvage and raw edges on the top and bottom and the cut edges on the left and right. This will help with your straps later. My fabric is plain so the wrong and right sides aren’t obvious. 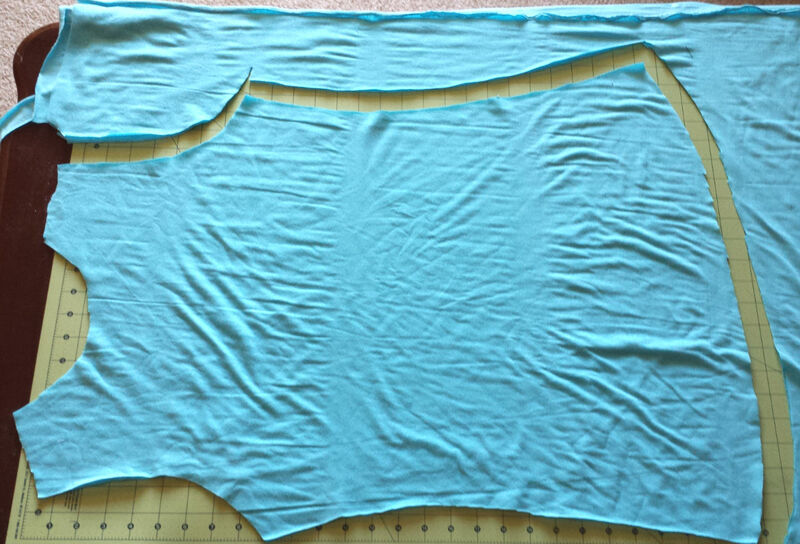 Cut 1/2 inch from the edge of the shirt. NOTE: I didn’t need pins here, but if you do use them. This will be your seam allowance. If you’re nervous you can cut more. Later in the tutorial I’ll show you where that will come in handy. Also, since this is a knit fabric I’m not worried about finishing the hem. I’ll talk more about that later, also. Put your scraps to the side. They will be used for your straps. 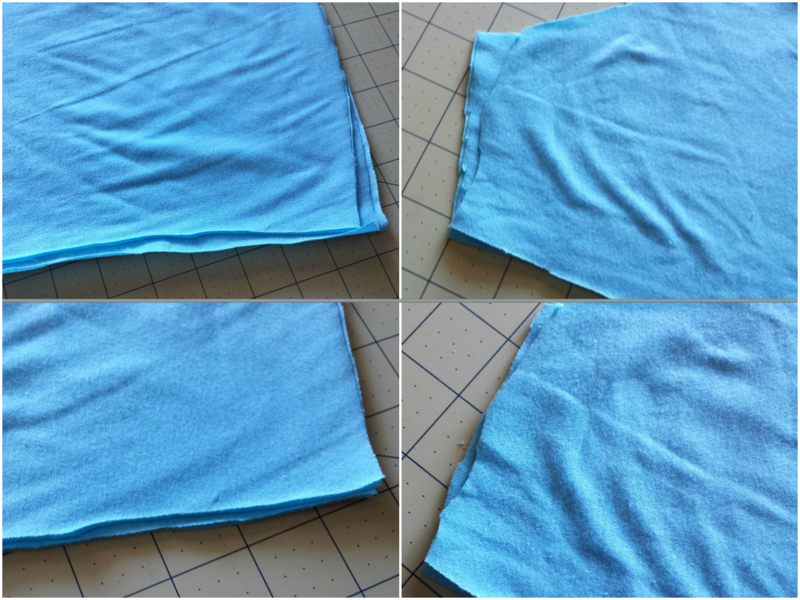 Once you have your shirt cut out you can fold it in half and trim the edges so that it’s symmetrical . 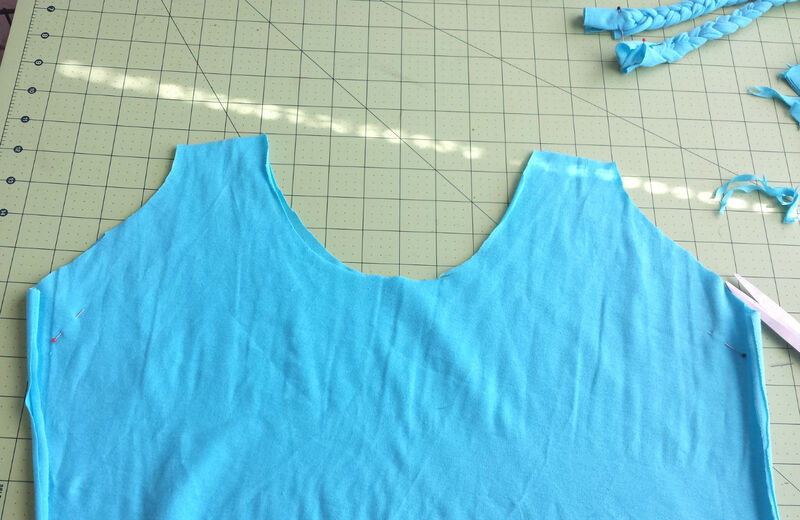 Now it’s time to make you neckline. Sometimes the neckline on the front and back are the same, in this case I want the front to be lower than the back. NOTE: Be careful when cutting the neckline. When you do your hem it will be larger. 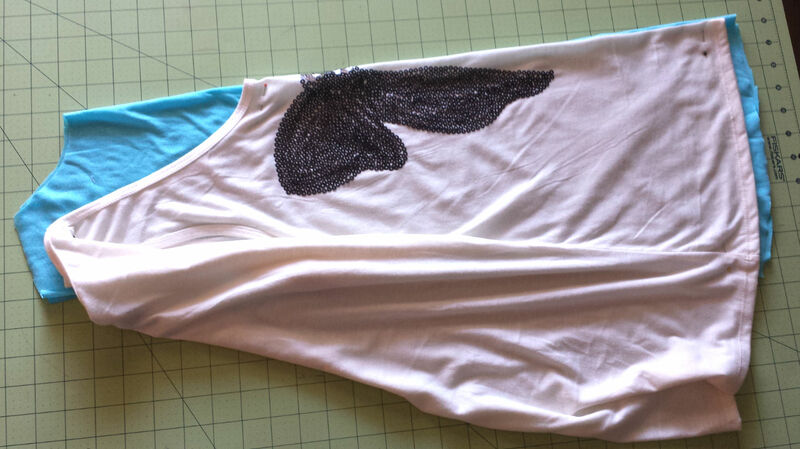 I liked the neckline of the shirt, so I lined up the seams and pinned the front of the shirt together. I matched it with the fabric I cut and trimmed the neckline, leaving some fabric for the hem. 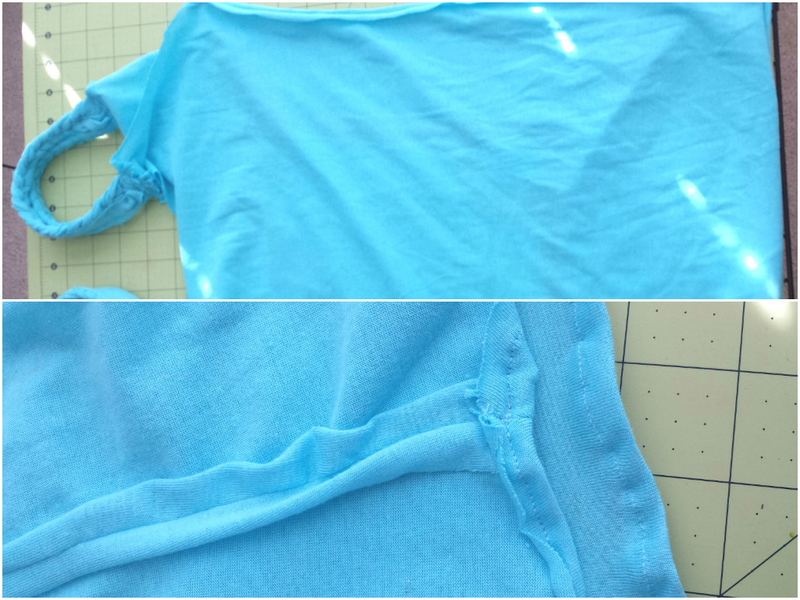 After I opened shirt I saw the neckline was too pointed, so I folded it back and trimmed small pieces at a time until I was happy with it while still being mindful of my hem. Now for the straps. I used the biggest scrap piece and laid it out length wise while it was still double layered. 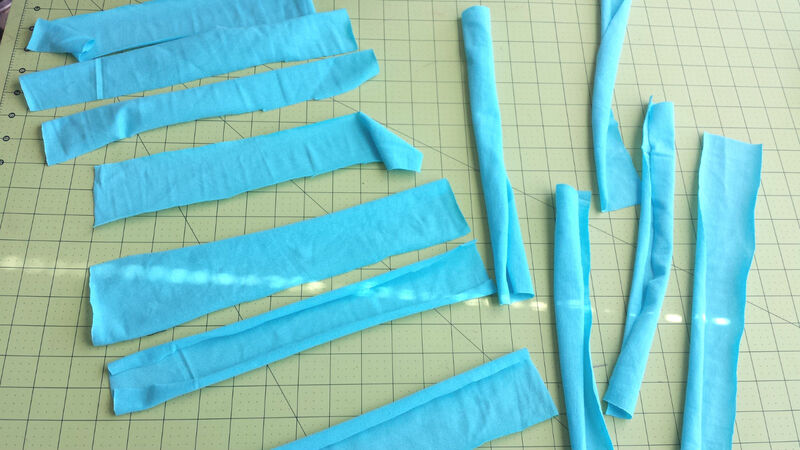 I cut three strips about 1-2 inches wide. Fold those strips in half and place them on top of each other. You should have three folded strips four layers thick. Cut each end of the strips so that the are clean and even. It doesn’t have to be perfect so don’t worry if it’s not. You should have 12 strips total. Now just braid the strips. You can use a pin to hold the end in place while you braid, baste stitch the edge or you can do like I did and hold the ends in your teeth (probably not the best idea but it works). 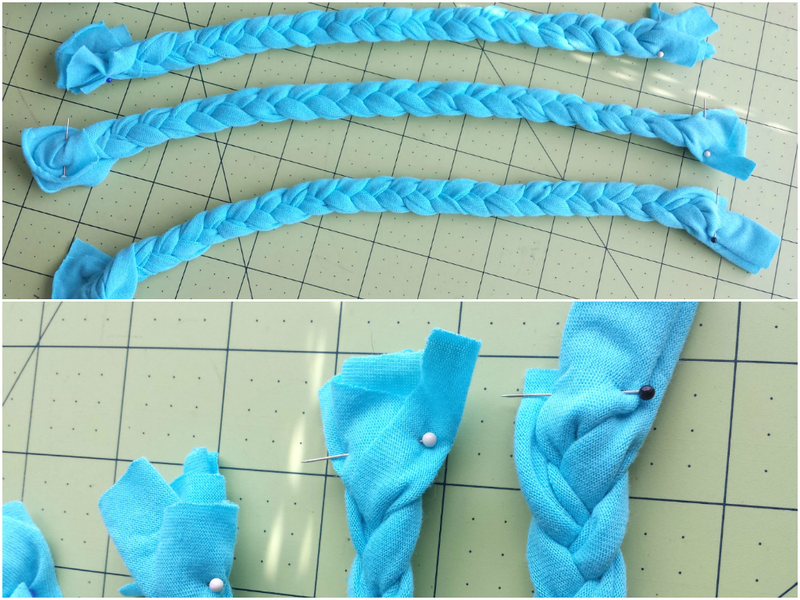 Once you get to the end hold the three pieces of the braid together and pin it to hold it together. Do the same to the top if you used your teeth. This is an optional step. If you want the straps to split while wearing then don’t do this part. If you want your braids to stay together this helps to do so. Place two braids side by side. 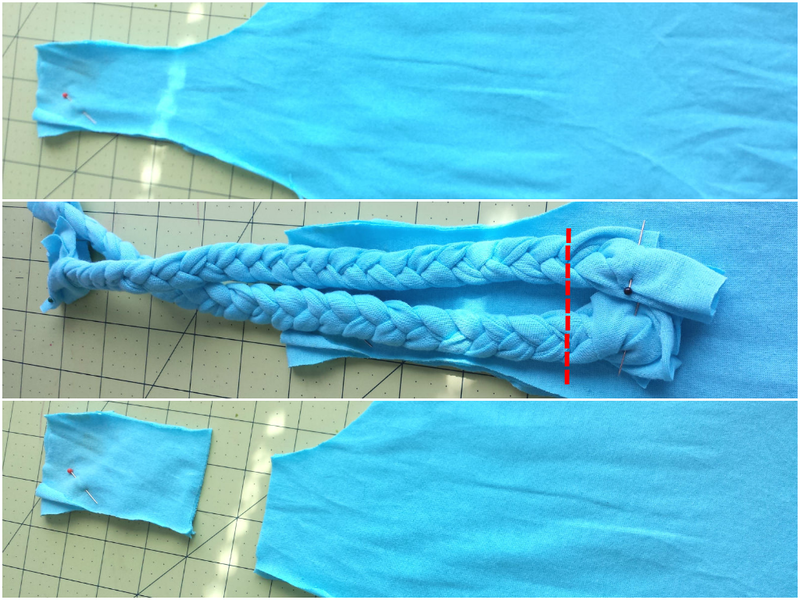 With another scrap piece of fabric that’s wider and longer than the two braids, place it on the bottom of your braids. Use some pins to hold it in place if you need to. This part may be tricky because the braids are thick, but it can be done. 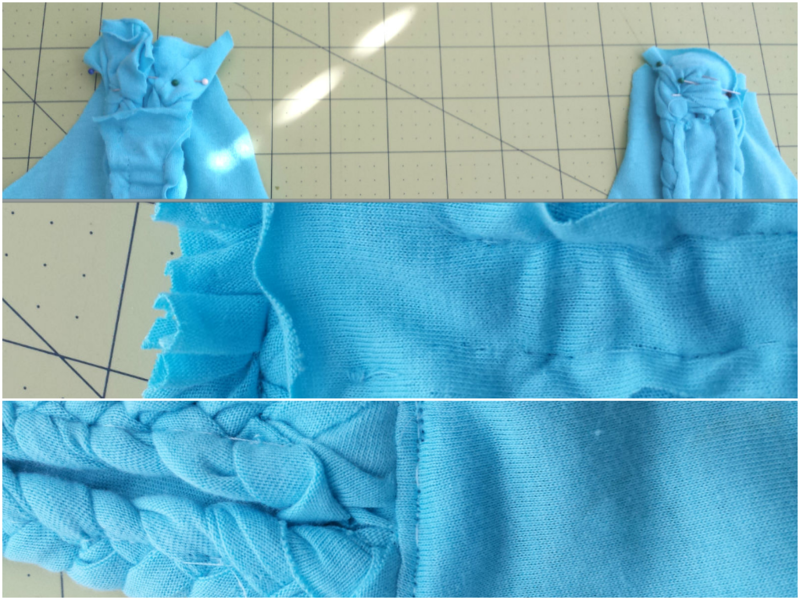 Leave some of the scrap fabric around the edges when you sew the braids on. It’ll be trimmed later. 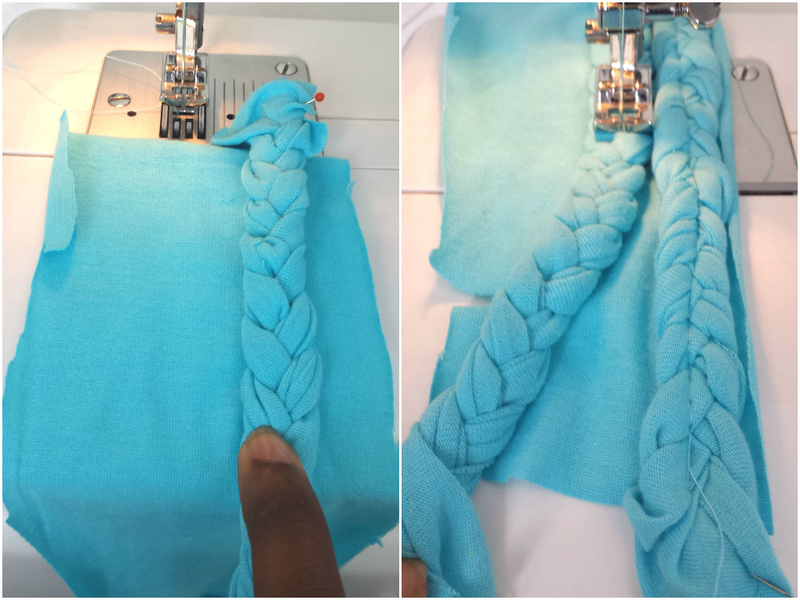 It may also help if you use the longest stitch on your machine and go directly down the middle of the braid. Try to keep the braids as close together as possible. 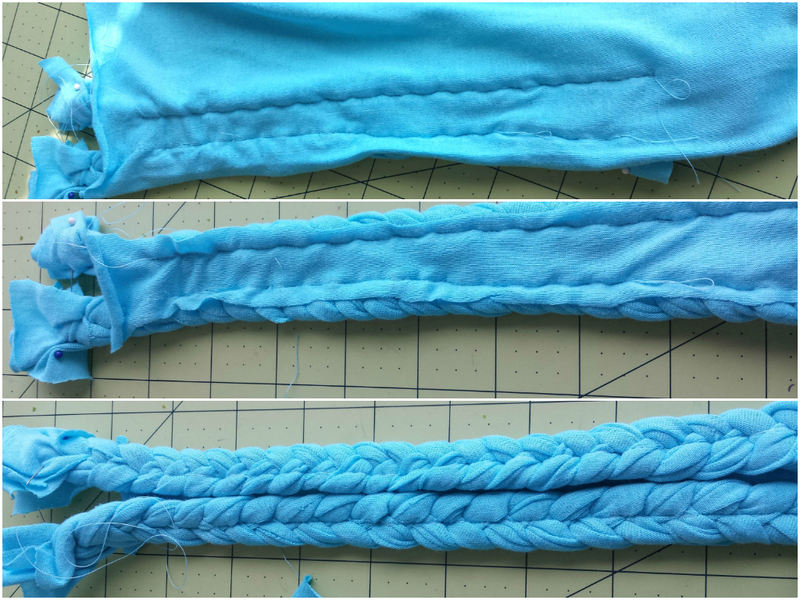 The fabric underneath helps the braids to blend together, but you don’t want to rely in it completely. 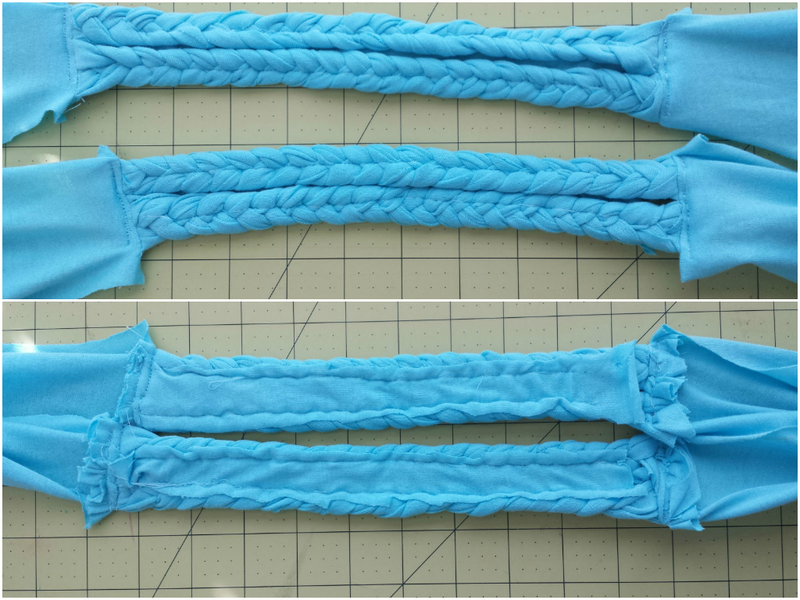 Once you have both braids sewn to the piece of the fabric, trim the edges. 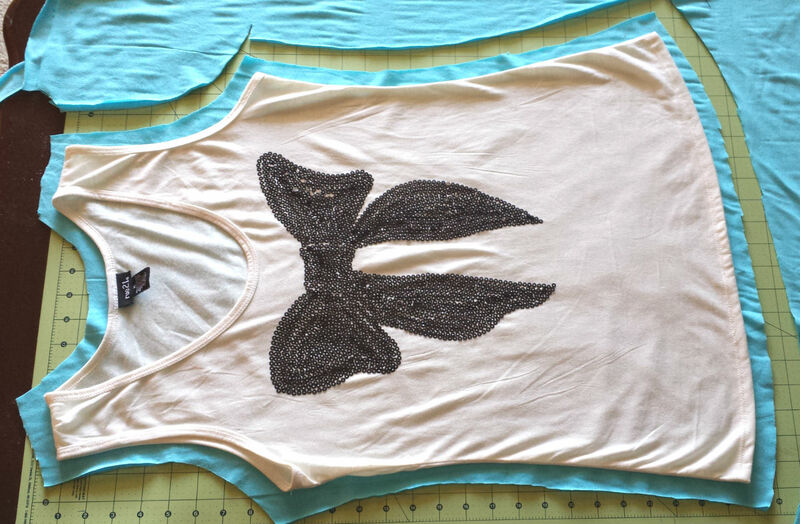 Of course the braids add length so you want to cut the straps from the shirt. TIP: Leave them there and use the braids as an embellishment. I trimmed the straps down so that they were as as wide as my braided straps plus the hem. I also had to trim the back neckline in the process. Fold the shirt in half so everything is symmetrical. Fold the braided strap in half, mark the middle. Place it on top of the shirt having the top of the sleeve line up with the middle of the strap. Mark where the end of the braided strap falls and cut. NOTE: Mark where the ACTUAL BRAID ends, not where the pieces of fabric end. That part is just extra and also there for your seam allowance. Place the braided straps and the fabric right sides together. 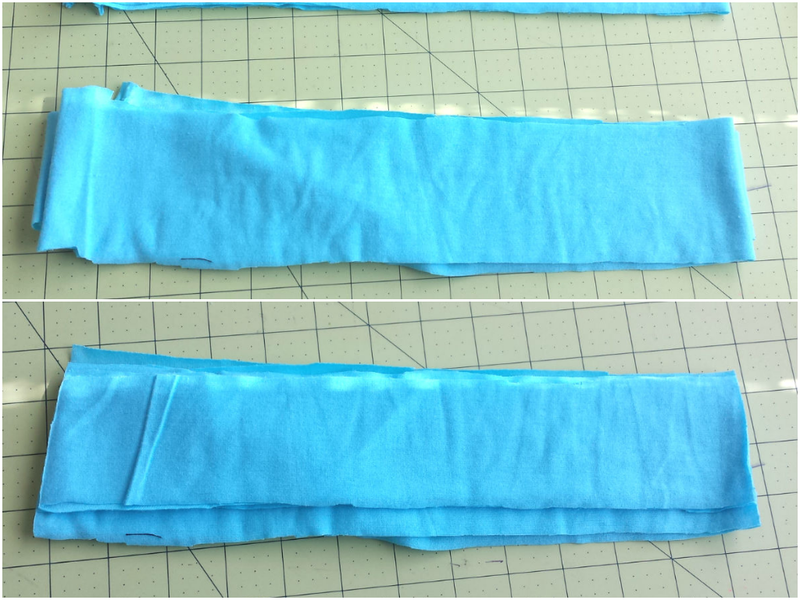 Place the straps in the middle so that you have enough fabric left to do your seam. Do this for the front and the back. 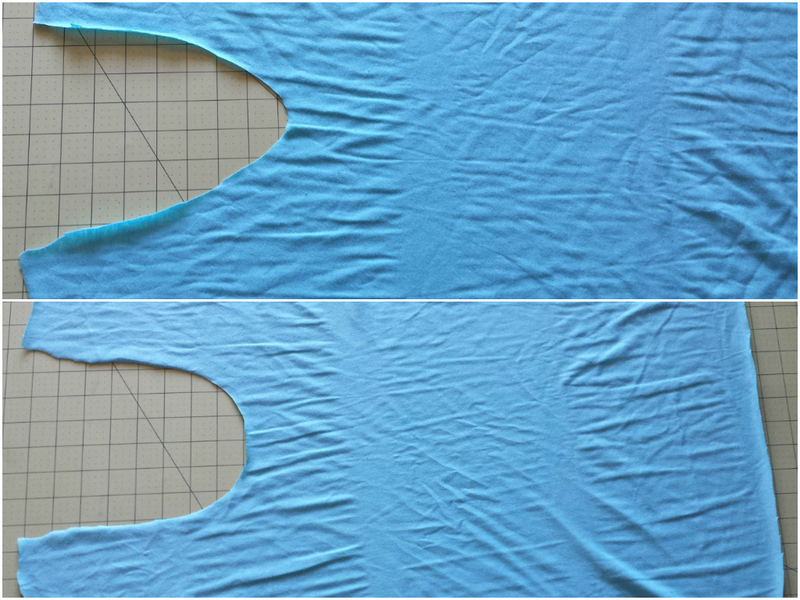 TIP: It’s easier to do the straps before sewing the sides seams in my opinion. Trim your seams. Once you have the straps sewn on sew an edge stitch close to the seam to keep the seam flat. This is where the extra fabric for the seam comes in handy. 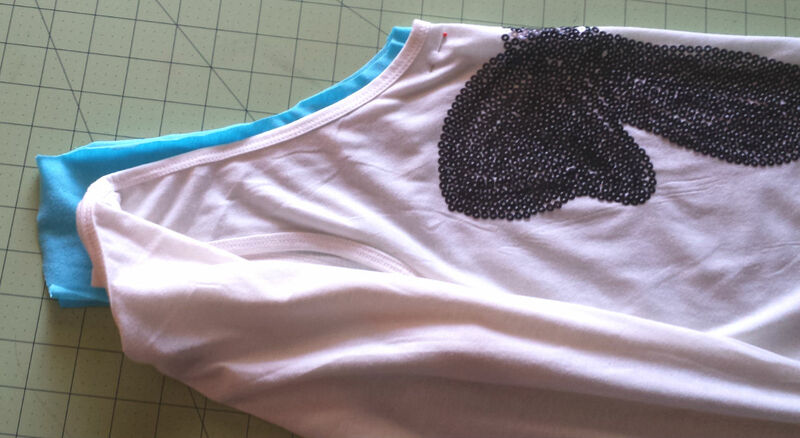 With right sides together, stitch 1/4 inch from the edge first then try the shirt on to see how it fits. If you like it then continue on to do you hem. If it’s too big, stitch another 1/4 inch from the seam you just made until it fits the way you like. Rip the previous seams or cut them away. Since it’s a knit fabric it won’t fray so you don’t have to roll your seam twice in order to finish. 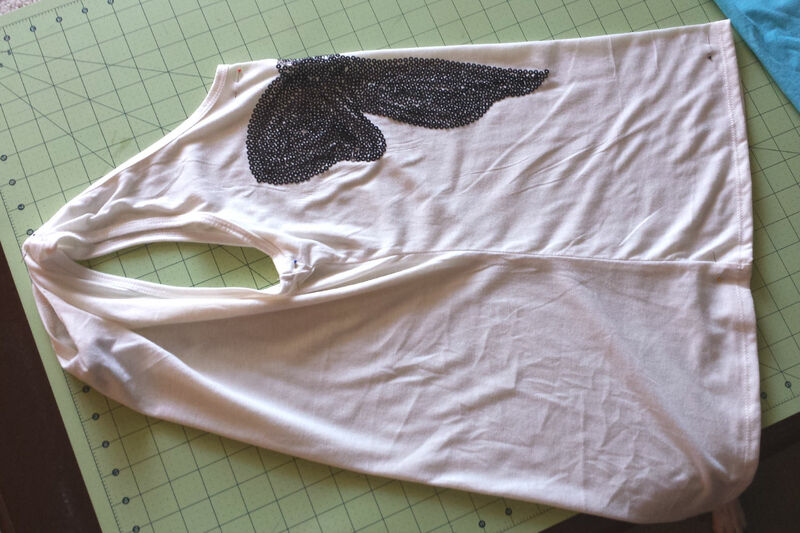 Hem your sleeves and neckline and then your done! Whoa! Where did that come from? I decided to take a stab at some bead work. VERY TEDIOUS! I thought about filling it in, but it took WAY longer than I thought just to do the outline. I do like it so if I do it again it will be on smaller scale. I actually already have another idea. 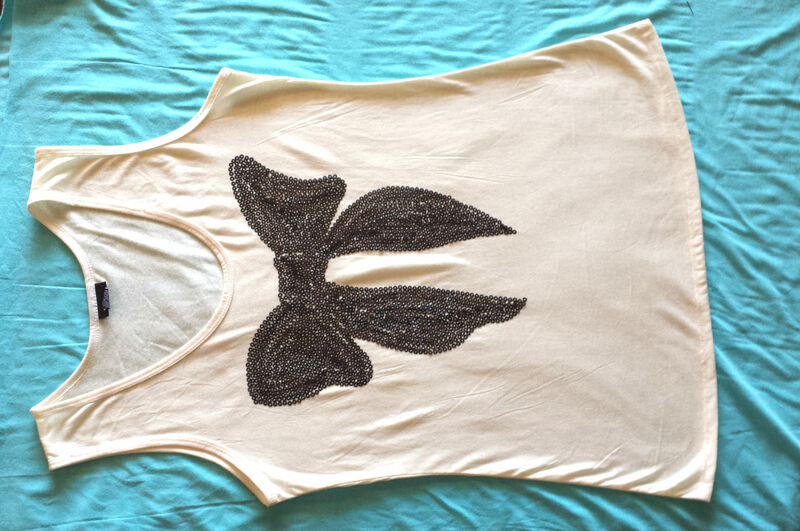 If you decide to tackle this cute top I’d love to see what you did! Tag me on Instagram and Twitter @EmeraldLilyCS. Don’t forget to like my Facebook page and subscribe to me on YouTube (there’s a video up now that shows you how I transferred my image for the beading) at Emerald Lily Craft Studio. Until next time! 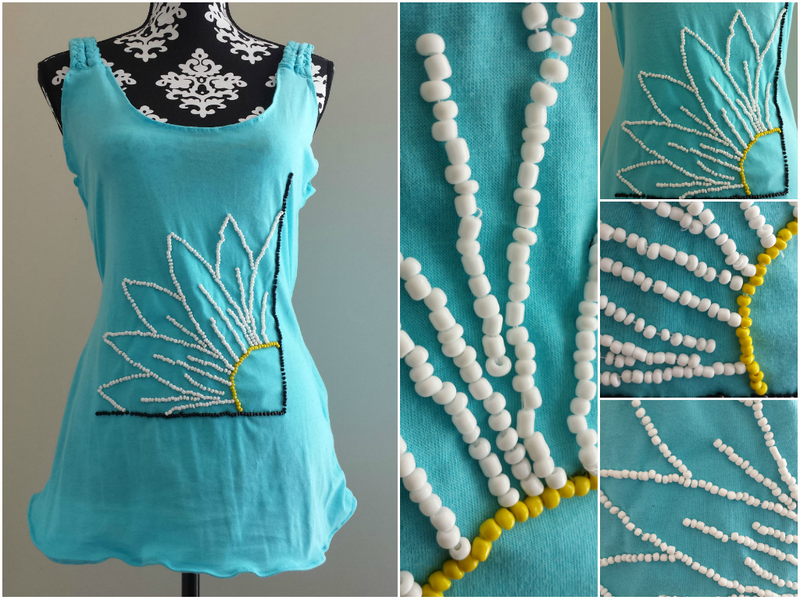 This entry was posted in Clothing and tagged apparel, beading, beads, braided, braided straps, embellishments, hand sewn, summer, tank top, tutorial. Bookmark the permalink.